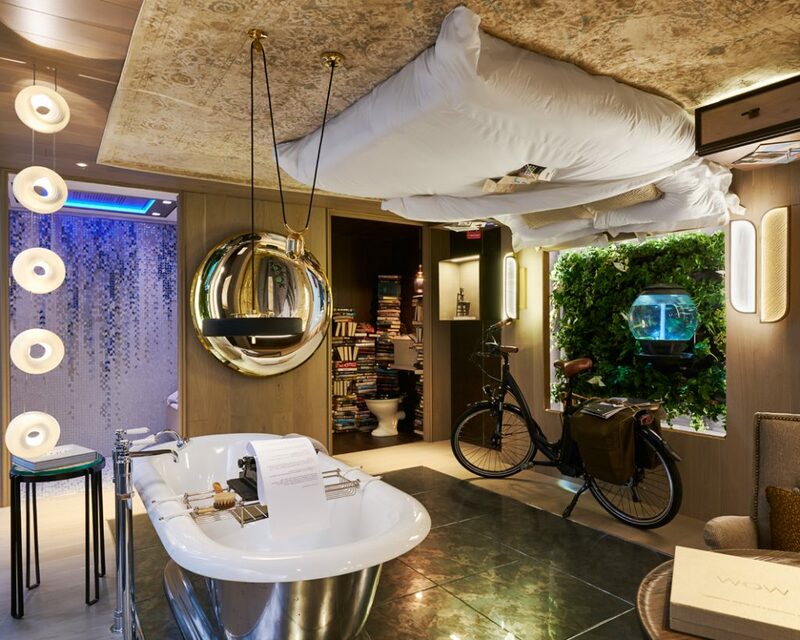 At the 11th annual edition of Sleep, Europe’s hotel design and development event which took place at London’s Business Design Centre on 22nd and 23rd November, the ‘Science of Tribes’ theme awakened the mind and curiosity. The 2016 Sleep Set, sponsored by Dornbracht, saw five teams of designers and fit-out contractors, from as far away as Japan and Singapore, convene to take on the Science of Tribe design challenge through the sleep set competition. The annual guestroom feature is widely recognised for questioning convention and transforming the way hotels and designers think about the spaces they create. Designing for Intellectuals, a tribe of culture-seekers and critical thinkers, Singapore-based WOW Architects collaborated with Edward Ray and Light Touch PLD in London to create a space in which guests can make the most of their luxury of time. This was a room where design norms were overturned to pose the question: “Which is your preferred reality?” The bathtub was the focus of the room – a place for contemplation and recharging – the desk was reinterpreted as a cosy window-side seating area, the W.C. became a library and a living wall and fish tank brought the natural world inside. The bed was placed on the ceiling, yet seen through a concave wall mirror, it reverted to being on the floor. A one-off installation, the stand promoted luxury living in a very unique way using the highest quality products.